The bulk acenaphthene crystal was grown in a single-wall ampoule by vertical Bridgman technique. X-ray diffraction analysis confirmed the orthorhombic crystal system of title compound with space group Pcm21. Thermal behavior of compound was studied using thermogravimetry—differential scanning calorimetry analysis. 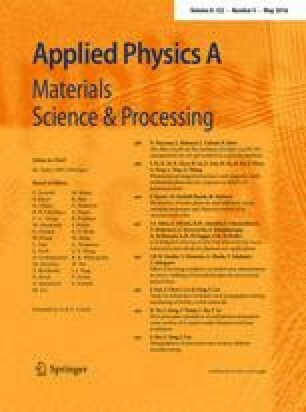 Thermal kinetic parameters like activation energy, frequency factor, Avrami exponent, reaction rate and degree of conversion were calculated using Kissingers and Ozawa methods under non-isothermal condition for acenaphthene crystal and reported for the first time. The calculated thermal kinetic parameters are presented. Dielectric studies were performed to calculate the dielectric parameters such as dielectric constant, dielectric loss, AC conductivity, and activation energy from Arrhenius plot. One of the authors S. Karuppusamy thanks the Anna University authorities for financial support through Anna Centenary Research Fellowship (Lr No: CR/ACRF/JAN2012/36). The authors are thankful to SAIF—IIT Madras for instrumentation facility.